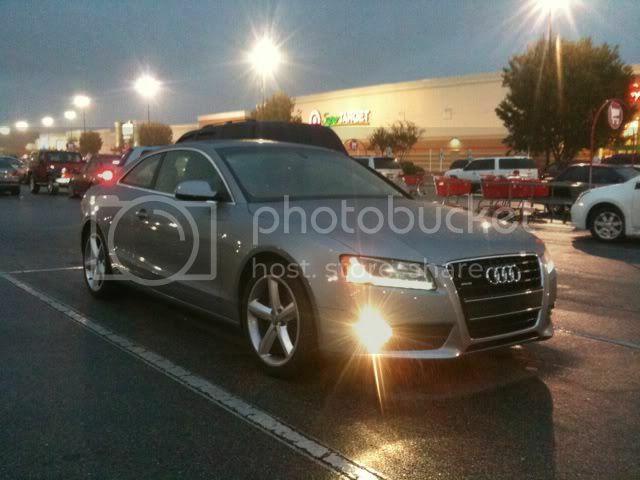 I was able to drive a 2010 Audi A5 last night. I must say, I was impressed with the car and loved it. The car drove great (even in the rain - thank you quattro), looked awesome, and just overall felt very comfortable. I assume that the A5 is mainly compared to the BMW 5series, and I have to say that I would choose an A5 over a 5series any day. (driven numerous 5series) This one was the 3.2 motor (which 2010 was the last year to get those) and the power was plenty good enough to get out of its own way. 1. There is no AUX or USB input in the damn car. There is a proprietary cable (not included) that can be plugged into an input in the glovebox, but that's it. I found that kind of crazy considering it's a 2010 model and most base model cars have one or the other now a days. This one had bluetooth, but it doesn't support streaming audio. (2011+ ones do, though) I guess AUX could always be added after the fact. 2. The price. The car (fully loaded, mind you) was $54k brand new. If I was going to spend that on a new Audi, I'd splurge another ~$8k and get the S5 for more power. Just sayin'. Overall, it was an awesome car and definitely a nice change of pace even if it was just for a bit. Just thought I'd write something up about it. Last edited by Beckham; October 12th at 04:22 PM. Cool writeup. Got any pics of the car you drove? Also, most of the newer Audi audio systems I've seen have sdcard slots versus usb/aux inputs. Although I think seeing all of them on a recent Audi I was shown. This one had an SD card slot, but I don't even own an SD card so it's rather useless to me. Here's the only pic I got since it was raining. Pretty neat shot. Micro SD cards are pretty much in every phone, so getting an adapter and using that wouldn't be much of a hassle. Seems like a pretty roomy car. How comfortable were the back seats? Would it hold 4 comfortably? The front was very roomy, but the back seats wouldn't be too good if you were over 6' tall. (depending on height of driver and passenger of course) I never sat in the back, but I'd imagine they were just as comfortable as the front seats (which were very comfortable). the A and S 5 are both beautiful cars. they are of a very few Euro cars i would own. they look REALLY nice with a drop, wheel/tire combo, and tint.